Our rack mount shutter interface provides 24 Volt AC, DC or relay closure signals to open and close air solenoids for operating shutters. Remote operation of the shutters is by 0-5V digital inputs. Each shutter may be separately placed in remote operation, closed, or open by a front panel mounted toggle switch. Operates on 110-240 VAC. 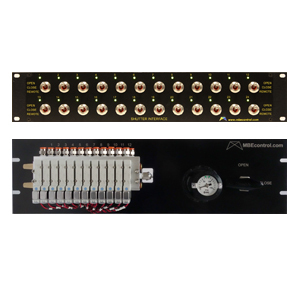 The standard configuration is 24 channels.